Poetry Day Ireland is March 21st 2018 and the micro-literature project Label-Lit has offered fifty poets around the globe the chance to share twenty verses. Together with poets across Ireland, there will be contributors spreading from England and Scotland all the way to South Africa and Australia. There will one thousand pieces of poetry stimulated this year by Belfast-based Maria Mcmanus. Today, I made the twenty labels from Wales and began hanging them in Llanberis. All the labels featured a quotation from a poem that will feature in my poetry collection to be published by The Lonely Press later this year. For more details about Label-Lit and Maria Mcmanus, follow this link: Label-Lit (https://labellit.wordpress.com/2018/03/04/take-me-home-a-thousand-times/). Arriving at the house each morning has been scintillating. Because of the Boathouse’s autumnal, late-breakfast starts, I have been allowed and extra hour to walk Sir John’s Hill before doors officially open, and have been refreshed and challenged by the unique way of starting a day. So, on the broad hill opposite Dylan Thomas’ riverside home, instead of the morning commute and the breakfast routine, I have been counting wrens, identifying distant mountains, trying not to appear alarmed at advancing dairy cows. In place of registering a class of effervescing pupils, I have had an entire bay of calm space to indulge in. Every day has had involved meeting with visitors to the Boathouse and encouraging them to share in Dylan Thomas’ imagery, particularly in regard to ‘Poem in October’ and ‘Vision and Prayer’. And each day will remain memorable for intriguing exchanges or unique encounters: the passing visit to the house by Wales’ Young Person’s Laureate, Sophie Mckeand, and by the Irish author, Andrew Phillip Smith; a visit from Noel James, the ubiquitous driver of the touring ‘writing shed’ around Britain during the Dylan Thomas 100 celebrations; having Scottish poetry recited effortlessly by a lady from Shetland while her son and I watched in amazement, meeting the kindest of folk and shared in their kindest of tales, their poetry recommendations, their thoughts on Dylan. The most common sensation I’ve experienced though is a blend of euphoria and sadness, for most people who have shared their ideas with me have continued to comment, ‘I haven’t spoken about books in a long time,’ while others have modestly footnoted that their artistic achievements took place, ‘a long, long time ago’. That a simple sketch, such as this one, can be the first drawing a qualified illustrator has completed in over a decade, is giving the collective poem a value I had not anticipated. The rediscovered experiences are paired with utterly fresh ones: yesterday, I read aloud some poetry in Dutch, was asked to ‘be quiet’ while the documentary on Dylan played, was beaten at ‘paper, scissors, stone’ by a four year old (who may have actually been three), stroked a dozen dogs and, finally, did not see the estuary mist up on sudden and heavy rain. Stilling the house in Sunday parlour silence. As a charged glass of red wine. Each Boathouse day, I have been made to feel entirely welcome by the staff: Toby answers my questions without showing frustration, and gives me enough of his knowledge so that I may, in turn, appear knowledgeable while misinforming visitors; Joyce and Lindsay introduced me to the local gull population, Paul showed me pictures of his stunning portraits, Carol her poetry, Judith her sculpture. They are blessed with enough craft to inhabit a gallery, but instead have been modestly introducing me as the ‘resident artist’ – mostly before I’m asked for coffee and cake from an arriving tour party. 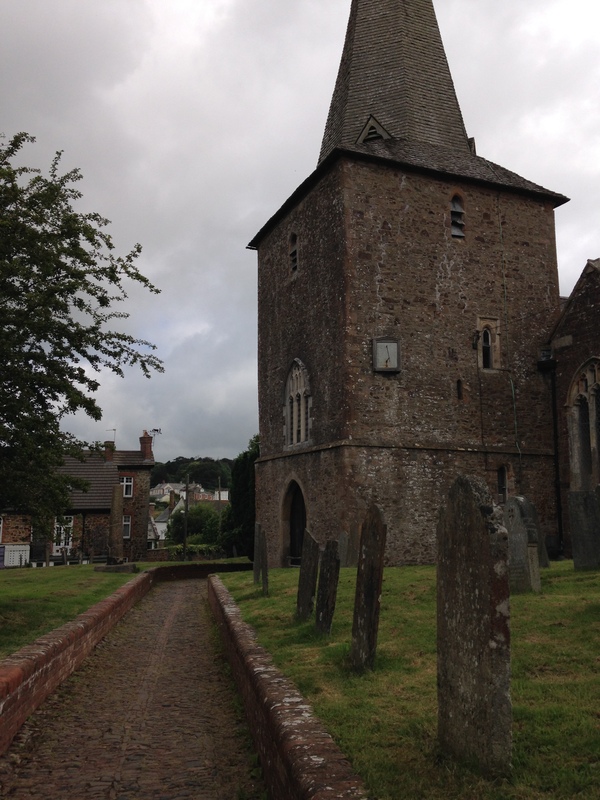 We scoured the map for North Tawton and saw it pulse almost in the centre of the county; it was, fortuitously, only miles away from the cottage we were renting. It took minutes to find the village, moments to find the blue plaque commemorating Ted Hughes’ life there. The landlord of a pub, rolling barrels into a thirsty cellar, reluctantly pointed the way, behind the churchyard’s arrowhead spire, to the house. We brushed our hands against the fingernail-thin gravestones on the channelled track and found a view over a lush land lake of a garden. Hughes’ wife Carol, the daughter of Jack Orchard, who later ran Moortown Farm (subject of the poet’s collection ‘Moortown Diary’) near Winkleigh, still lives in the home but the site is better known as the home he shared with both Sylvia Plath and Assia Wevill. From a horse chestnut tree that leaned from the garden to the graveyard, I unhinged a conker; it looked too juvenile to contain anything inside the fruit. Fell in love with her, and I knew it.